I did! I caved and now do things I never thought I would do as a stay-at-home mom. Prior to actually being a home with the kids, I had all this wild ideas of how it would be. How I would! Well that's all out the window now. I had this realization today......as my kids were locked in their bedroom.....I'll explain, I'll explain! Laundry will always be done, and won't pile up! I'm literally laughing out loud right now. I spent the entire day today trying to fold 3 loads of laundry that piled up over the weekend. 3 LOADS! Actually folding laundry requires not having "helpers", which doesn't ever exist unless they are sleeping. But let's be honest, when they sleep, I want to do NOTHING but relax! Our washer and dryer are in our bedroom, so you can imagine my dear husband's annoyance when he trips over a pile a laundry in the early hours, and I have to pretend I'm still sleeping and not laughing. Dinner will be home cooked every night. Nope, doesn't happen! Yes, I cook dinner nearly every night, but I give myself a night off once MAYBE twice a week, and we get a pizza or have the only restaurant that will deliver to us bring up some fried up deliciousness. Let me be clear though, home cooked sometimes means grilled cheese or cereal. I'm putting it together AT HOME, so it totally counts! I'll work out before the kids get up. This has yet to happen in the nearly 5 months I've been home. Not because I don't have an amazing treadmill in the basement that my friend has used more than me, but because I don't want to. Sleep is much more important to me, because my kids drain me. And yeah, yeah, yeah, "exercise gives you energy,".......shut up. No one wants to hear that. I love my sleep, end of story. The kids and I will get dressed and ready every day. Why? What's the point? If I get them out of their pajamas, it just means I have more laundry. I mean we get "ready" when we go somewhere, but besides that, we just try to make sure we look presentable by the time boss man gets home from work. I will spend all my time with my children. No, because this mom still needs her sanity. This is where the kids being in their bedrooms come into play. To preface this, my kids' rooms are COMPLETELY childproof, so I have no fear of anything happening to them. Layne and Kayden hang out in Kayden's room from time to time during the day and play. They might be in there while I try to tackle laundry in the next room, make a phone call with no screaming in the background or lay outside of their door for a quick 10 minute snooze. I check on them frequently, and listen for screams, but sometimes the presence of just a door between us is all I need to refuel myself to make it through the day. If you've read any part of my blog before, you will know this is far from true. I rationalize it in my head by telling myself that we are here all the time so it is nearly impossible for it to stay clean. It is the same reason we always seem to be out of groceries. Our house isn't dirty, just lived in. To anyone that has stayed home before or is thinking about it, what are your wishes? I mean, it probably will never happen, but like my dad always said, "It's nice to dream!" 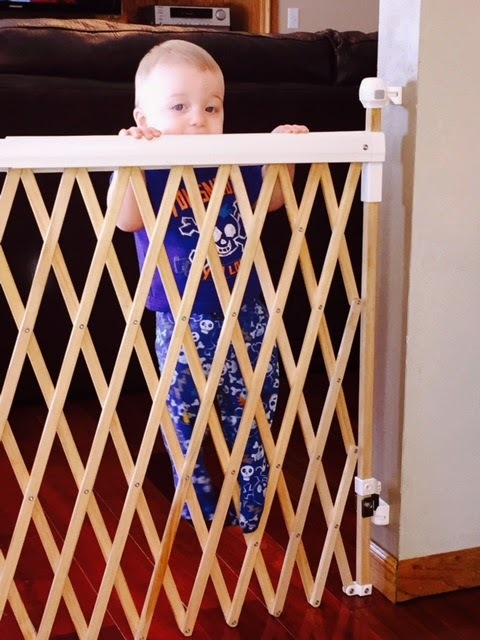 Layne learning too quickly how to climb baby gates!